Results 1 - 15 of 73 for "cocijo"
Actual Location: National Anthropology Museum, Mexico City, Mexico. Provenance: Antechamber of tomb 103, no. 1, Monte Albán, Oaxaca. Reference: Caso 1938: 69, 70, 71, fig. 88; Caso & Bernal 1952: 288, fig. 437; Romero 1958: 210, plate XLV; Gendrop 1970: 138, fig. 159b. Comments: The piece was found in the antechamber of tomb 103, which was excavated by Caso during the sixth period (1937). Next to this piece, a pot with double pouring handle, decorated with a Cocijo head in front and with a black, polished cylindrical glass was found, as well as some fragments of earthenware bowls with fresco polychrome decorations. The tomb was dated MA IIIA-IIIB. See the other two effigy vessels of this tomb under MNA t/103 Nos. 2 and 3. Provenance: Tomb 109, Monte Albán, Oaxaca. Color: Grey clay with red pigment. Reference: Caso 1938: 92-95, fig. 105; Caso & Bernal 1952: 122, 286, figs. 193, 434; Easby et al. 1970: 145; Bernal 1979: 145. 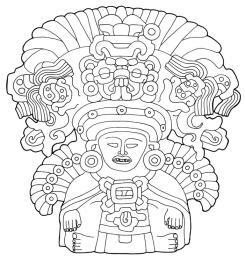 Comments: Cocijo's representation in the headdress. The eyes on the woman's face are decorated with shell. Found in tomb 109, in 1937, during Alfonso Caso's sixth field season. The tomb was dated MA II-IIIA (transition). 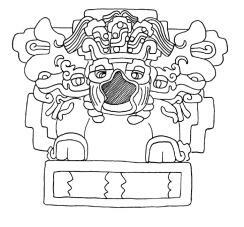 Glyphs: Glyph M "Cocijo" in the headdress. Actual Location: Museum of Cultures of Oaxaca, City of Oaxaca, Mexico (exhibited). Provenance: In front of the entrance to tomb 7, Monte Albán, Oaxaca. Reference: Caso 1932a: 19-20, fig. 32; Caso, 1932b: 466-467; Caso 1969: 43; Caso & Bernal 1952: 44, figs. a, b, c; Bernal 1979: 144, fig. 52. Comments: This piece was found with another equal piece flanking a central piece. 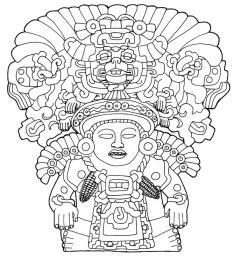 Caso and Bernal (1952: 46) identified them as Cocijos ("clearly identified as Gods of Corn"). Tomb 7 was excavated by Caso during the first PMA I period (1931-1932). The three pieces were found broken and, according to Caso, the position of the fragments demonstrated that the break had been intentional and that, after doing this, the pieces had been buried (Caso 1932a: 20). Glyphs: Glyph C in the headdress flanked by two ears of corn. Actual Location: Saint Louis Art Museum, Saint Louis, Missouri, United States. Collection: Everett Rassiga; Morton D. May. Color: Gray clay with traces of red pigment. Reference: Photo from Shaplin's files; Parsons 1980: 143, fig. 217; Winter 1994a: 149. Comments: Representation of Cocijo. The piece's back is engraved with two shapes of "Os" and incised lines. Glyphs: Glyph C in the headdress. Dating: Shaplin and Zimmerman, 1978, TL no. 13 (320 rads, authentic). Measurements: 42 x 28.5 x 26 dia. cm. Color: Grey clay with traces of red pigment. Reference: Photo from Shaplin's files; Parsons 1980: 138, fig. 210; Winter 1994a: 154. Comments: This piece represents Cocijo and is part of a series of five identical pieces. Dating: Shaplin and Zimmerman, 1978, TL no. 8 (275 rads, authentic). Actual Location: Frissell Museum, Mitla, Mexico. Measurements: 10.8 x 9 cm. Reference: Boos 1966b: 15, Boos 1968a: vol. III, plate XII; Eubanks 1999: 133, fig. 107. Comments: Pot with two pouring handles. This piece is similar to other vessels with double pouring handles and Cocijo face, but, in this case, the handles have the shape of ears of corn. Compare with MNA 6-682 and MNA 6-6708. Actual Location: Museum für Völkerkunde, Vienna, Austria. Provenance: Santa María Atzompa, Oaxaca. Measurements: 102.5 x 95 cm. (!) ; Boos da otras medidas 41 x 38 cm. Color: Traces of red paint. The face is painted in blue. Reference: Seler 1960: plate 17; Bernal 1966: 81, fig. 1; Boos 1966b: 73, fig. 52; Winter 1994a: 150. Comments: For other examples, see MNA 6-635, cm.A 44.78, EMB 24882, MDO 32 and MFR s/n 1. For an analysis of this type, see Sellen 2002: 9. Glyphs: Glyph C in the headdress. 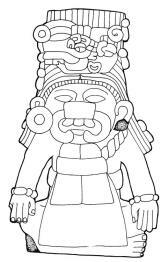 Cocijo mask (glyph M) flanked by two ears of corn. Actual Location: Dolores Olmedo Museum, Mexico City, México (exhibited). Collection: Fernando Sologuren; Armilia Van Rijn (195?-1964); Dolores Olmedo Patiño (presently). Measurements: 51 x 46 cm. Reference: Caso & Bernal 1952: 98, fig. 163; Boos 1966b: 65; 50-peso bill circa 1973; Eubanks 1999: 137-138, fig. 110; Sellen 2002: 9, fig. 5e y 11, fig. 8. Comments: This piece was probably found by Fernando Sologuren at the beginning of last century. In 1928, Caso and Bernal (1952: 97) took pictures of the piece when it was at Mercedes Sologuren's house. At the beginning of the 1950s, the piece went to Machida Armilia Van Rijn and then, in 1964, it was acquired by Dolores Olmedo Patiño (personal communication Patricia Van Rijn, 1999). For other types, see MNA 6-635, cm.A 44.78, MFVV 55.158, EMB 24882 and MFR s/n 1. For an analysis of this type, see Sellen 2002: 9. For the same Etla style, see MDO 33 and MFR 12619. Glyphs: Glyph C in the headdress flanked by two glyphs of small plants and then, two glyphs for corn. 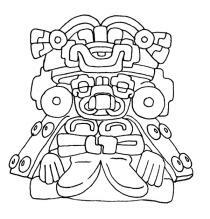 The figure in the headdress corresponds to the Cocijo (glyph M). Actual Location: Cleveland Museum of Art, Ohio, United States. Collection: Donation from the Eastman Family. Measurements: 37 x 26.5 cm. Reference: Boos 1966b: 74, fig. 53. 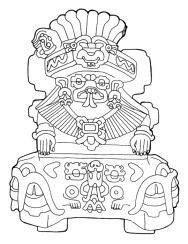 Comments: The pectoral and part of the headdress are missing from this piece. For other examples, see MNA 6-635, EMB 24882, MFVV 55.158, MDO 32 and MFR s/n 1. For an analysis of this type, see Sellen 2002: 9. 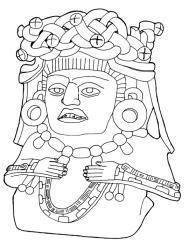 Glyphs: Glyph C in headdress flanked by two ears of corn. 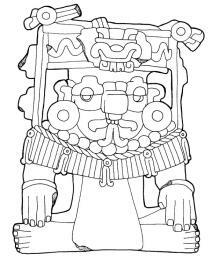 Cocijo mask in the headdress (glyph M). Actual Location: Smithsonian Institution, Washington D.C., United States. Collection: Louis Gustave Bellon; George Gustave Heye. Heye purchased this artefact at auction in Paris in 1928. 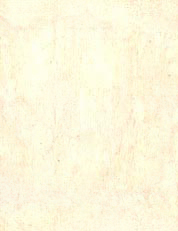 Color: Light grey clay with traces of white paint. Reference: AMNH, Saville Archive, box 28, Inventory of the Bellon collection; Boos 1966b: 39, fig. 14. 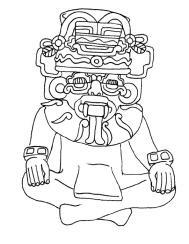 Comments: Seated figure with Cocijo mask. Glyphs: The notched bead in front represents coefficient 1. Glyph J in the headdress (1 J). Actual Location: Monte Albán, built in the facade of tomb 104. Reference: Caso 1938: 73 and 76, fig. 92; Caso and Bernal 1952: 51, fig. 72. 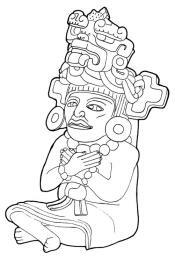 Comments: The figure holds a bag of incense in one hand and the other hand is stretched out. This hand was mutilated by a tourist a few years back. 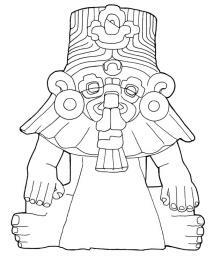 In 1938, Caso identified this piece as Pitao Cozobi or God of Corn, but later, together with Bernal, they decide to classify it, in their work of 1952, as the "God with Cocijo Head in Headdress". 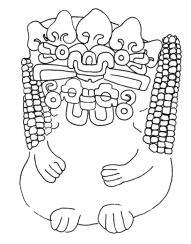 The headdress mask belongs to the Xicani and is flanked by two jaguar heads. Actual Location: Mexican Museum of Prehispanic Art, Rufino Tamayo, Oaxaca, Mexico. Comments: This large urn of Cocijo is part of a series. There are at least two more of the series, but there were probably up to five pieces in total. One piece is held at the Birmingham Museum in England (BIRM 1965.331) and another is in Stanford, United States (SUAM 1997.167). The said pieces are more complete than the piece illustrated here. Actual Location: Swedish Ethnographic Museum, Stockholm, Sweden. Measurements: 37.9 x 31.9 cm. Color: Front part in red. Traces of green paint. Reference: Linné 1938: 160, plate 31. Comments: The piece has been partially restored. According to Linné, it was wearing a Cocijo mask. Glyphs: Glyph J in the headdress. 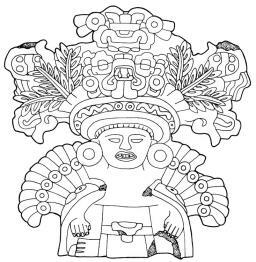 Two alligator eyes in the throne's back and above these, two glyphs for sprouted corn. Actual Location: Civic Museum of Turin, Italy. Collection: Zaverio Calpini , circa 1876; Callegari gives an earlier date 1864 (1931: 514). Provenance: Nochistlán o Xoxocotlán (Callegari 1931: 514). Reference: Africa, America, Australasia: the Ethnological Collections, Civic Museum of Turin, 1978: 66, fig. 17. 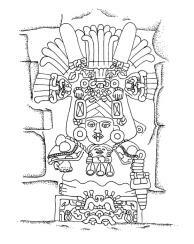 Glyphs: In the headdress, glyph M "Cocijo", seen sideways. Beside the jaw, numeral 1 (1 M). Collection: Guy Loudmer Auction, France. Reference: Guy Loudmer auction's catalog, Precolombian Art, fig. 32, Monday, December 9, 1991. Comments: Central vessel of a series of three (See GLS 2 for accompanying pieces). 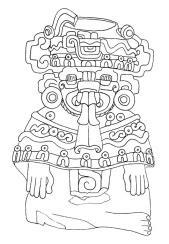 Glyphs: Under the mask of Cocijo, two numerals, which could be 2 M? but also 2 knot because of the bow on the chest. Glyph C in the headdress.